PRODUCT DESCRIPTION: Snake Guard Snake Trap is a trap designed for use inside a structure where a low profile trap is needed. 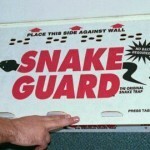 The Snake Guard Trap will catch snakes up to 8 feet long without hurting them. Snakes can enter the trap from either side and are naturally drawn to the dark, sheltered space. Traps measure 23" long by 11.5" wide by 2.5" tall. Once they enter, the glue inside will securely hold them so the trapped animal can be destroyed or released depending on local ordinances. The trap is made of cardboard design with a tacky glue inside that's sure to hold most any snake. This glue is applied in such a way to insure the snakes will get caught without being able to bite or escape. WHERE TO USE IT: Inside where it is relatively dry. This includes living areas, attics, crawl spaces, sheds and garages. RATE OF APPLICATION: 1 or 2 traps per room which is suspected of having a snake. More may be needed in large rooms.